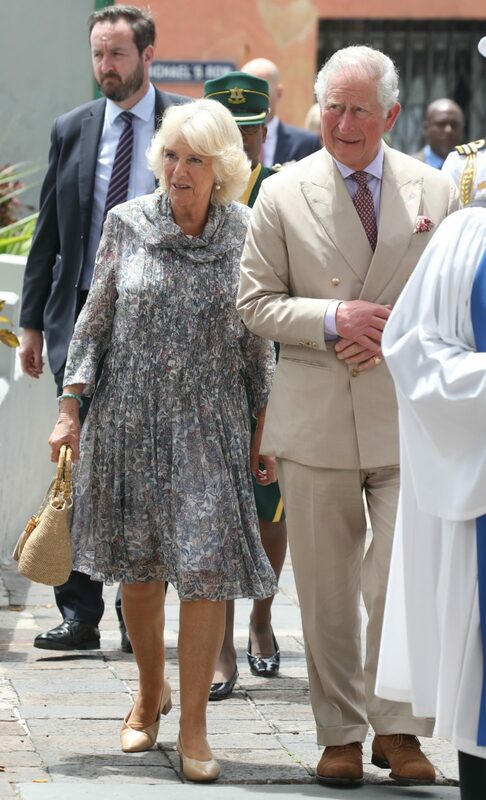 She’s been touring Barbados with husband Prince Charles and Camilla, Duchess of Cornwall has stepped out in one of her most fashionable outfits to date. The 71-year-old attended a church service at St. Michael’s Cathedral in Bridgetown with her husband by her side on Sunday. Proving she’s every inch the royal when it comes to fashion, Camilla opted for a chiffon patterned dress for the service. The outfit showed off the royal’s legs and she accessorised the look with a handbag, tan shoes and a stunning pair of earrings. Meanwhile, Prince Charles looked as handsome as ever in a linen suit, proving the perfect outfit for the warm climate. Charles and Camilla were greeted by the Bishop of Barbados, John Holder, when they arrived at the church service. The next stop on their tour is Havana. The pair had previously spent time in Grenada and were treated to some traditional performances when they visited St George’s waterfront in Carenage last week. They were welcomed by the Prime Minister of Grenada, Keith Mitchell and Governor General Dame Cécile La Grenade when they initially touched down. The couple signed the visitors’ book at Parliament, before making their way to a reception and to view exhibits. They also stopped by the House of Chocolate where they learned about the history of the cocoa industry in Grenada. The House of Chocolate began in 2015 following the success of the Grenada Chocolate Festival to provide a year around a hub of information and chocolate related products. As for Camilla, she’s worn a number of stylish outfits on the trip. Last week she stepped out in a pink kaftan top with matching white pants. She accessorised with an umbrella in hand to shade her from the hot Caribbean weather. Both Camilla and Prince Charles also joined singing superstar Lionel Richie for a special meeting in Barbados to discuss the importance of supporting young people in need. The three friends spoke about Charles’s charity the Prince’s Trust and Lionel gave a touching speech on the progress young people in Barbados thanks to help from the charity. Are you a fan of Camilla’s style? What is your favourite outfit?